I definitely feel like another title for this post could be The Good, The Bad, and The Ugly, but we’ll get into that shortly. The best news in the world is that he is standing on all 4 legs, and came out of anesthesia, albeit a little too eagerly, but intact (bar a small rub on his eyelid). When I got that call yesterday morning, that’s all I had ears for. Backing up a bit- before surgery itself, the surgeon wanted a few more radiographs of the fetlock as well as the ultrasound the soft tissue in the area to determine if there is any damage to the suspensory. The good news is the suspensory ligament looks good, but because of something seen on the scope, she will also be ultrasounding the collateral ligaments as well today. Hopefully nothing, but it’s good to check. In surgery itself, they were able to take out the bone chip that was associated with the cyst (good), but the cyst itself was out of reach (bad) unless we wanted to crack the joint open like a walnut (not happening). That cyst is now pretty much the bane of Foster’s current existence, as they were able to confirm that has caused a fairly significant scoreline in the surrounding cartilage and will eventually (likely) become a situation where little-to-none cartilage remains. anyone have experience with either of these?? AKA- what does my horse’s future looks like? Well, in some ways it’s a pretty big question mark. Only time will tell how the cyst will develop. If the following treatment is able to stop it in its tracks right now, great. If it continues to develop and tear up the cartilage, his future as a sporthorse looks somewhat bleak. Worse case scenario he loses about 10% of the cartilage in the joint. As far as the main doctor there thinks (side note: he also assisted in the surgery; I was thrilled since everyone and the internet sings his praises- awesome! 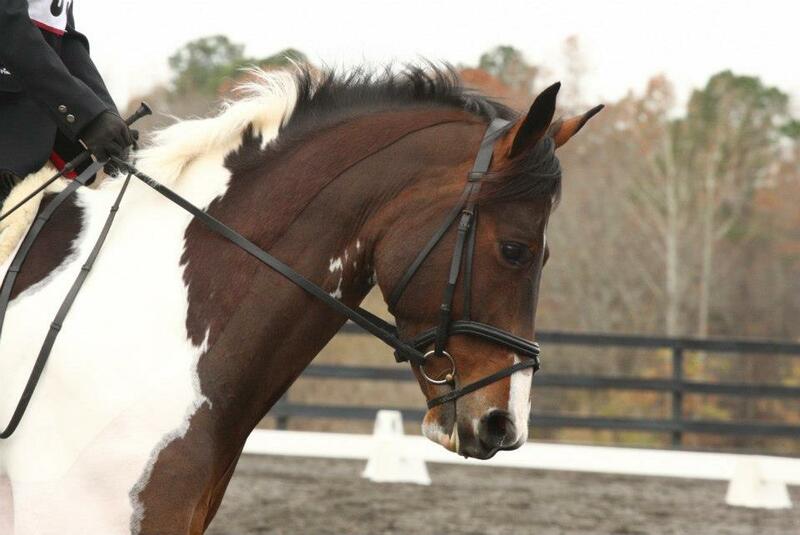 ), he could likely continue a career as a low level eventer for some time (though how long we won’t know). Low level being defined at Novice/Training horse trials, and Prelim Combined Training (dressage + stadium only) events. This is great, because Preliminary CT’s have only ever been my goal with this horse, or really any horse. What limits Foster is obviously concussion to his joint, so lots of galloping, jumping great heights or lots of tall cross country drops are not recommended. No one can guarantee a time frame for eventing, and it was made clear to me that if he can’t event (due to being uncomfortable) there is no reason why he couldn’t become either a dressage horse or a show hunter (Dr’s words). This is fine news with me, since my plan was always to eventually focus on dressage with him and hopefully pursue that bronze medal and beyond. Likely, we will always be looking at some kind of maintenance with the fetlock, probably in the form of IRAP injections. And as far as the future goes, only time and Foster will tell us that. It all sounds super positive to me! The worst is hopefully over, now time to focus on getting him back again :). Definitely don’t spend too much time worrying about the future; just think positive and keep moving forward! On a side note, my vet told me to use Osphos. But I have spoke with vets who have used it a lot and believe that it isn’t effective as Tildren. So where Tildren costs a significantly amount more, they recommend doing it because you only do it once compared to doing Osphos multiple times which ends up costing the same. Not sure how accurate that is, but what I have heard from vets. Very interesting regarding OsPhos vs Tildren. The surgeon here has a lot less experience with OsPhos and so couldn’t really promise results, but the price tag is definitely nicer. I’ve also heard of some adverse reactions with Tildren, and different opinions regarding administering it regionally versus a drip. So many things to look into, and I appreciate any thoughts! I’m sorry the news was mixed, but so glad he came through the surgery okay. When my mare had surgery a couple years ago, I was essentially breathing into a brown paper bag until they told me she was on her feet and fine. Absolutely- that feeling of waiting and not knowing was absolutely awful! Kind of up and down news, isn’t it? If it helps any, Guinness has some really spectacularly f’d up fetlocks, probably due to bone chips. (The only visible chip is halfway up his canon bone, but it’s pretty obvious he had some chips out of the fetlock, too.) While his jumping career pretty much halted when his cartilage level dropped to basically nonexistent, his fetlocks have now fused and his dressage career is quite bright for 3rd+. It’s really just age and other failing joints holding him back. 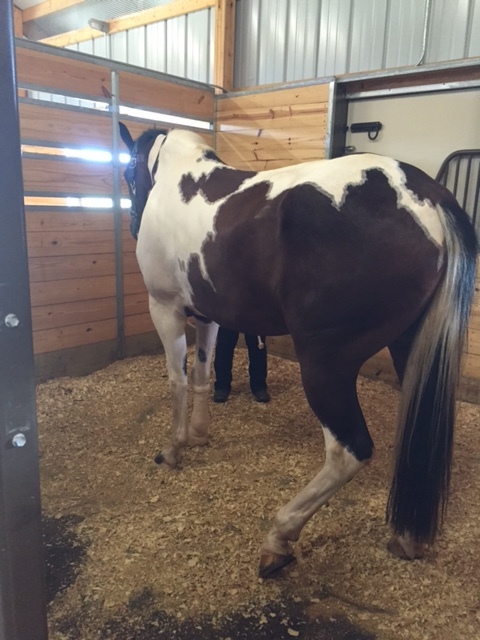 The fetlock issue does limit his extension ability (fusing led to some serious limits in mobility in the joint, down by about 70%), and changes his necessary good angle. However, he’s sound, and happy without any joint supplements or injections (looking at three years since his last need for fetlock injections). Full turnout helps a ton with that, so you might ask your vet about that. Hugs to you! I just wanted to tag onto Austen’s post- after my Wilbur stuff I’m a big fan of full time turnout! It doesn’t sound like that’s in the instruction list- but I just found that it was instrumental to healing. Full time turnout unfortunately isn’t an option at our current facilities (no shelter/trees and limited space) but definitely something to keep in mind! This is definitely interesting, and it’s good to know that you’ve had success with fused fetlocks. Foster has lost some motility in his joint, but I am hopeful that some of that will return post-surgery. Definitely love hearing any and all success stories! Glad to hear it all went well. Seems like a pretty good prognosis. Glad he is on the mend. Hope for the best for you. So hard when you don’t have a clear answer. I do think horses often surprise us when we need them to though! It will work out. One step at a time. Glad the surgery went well! It’s pretty difficult to see in the picture, but there is a track running along the ceiling above the table. 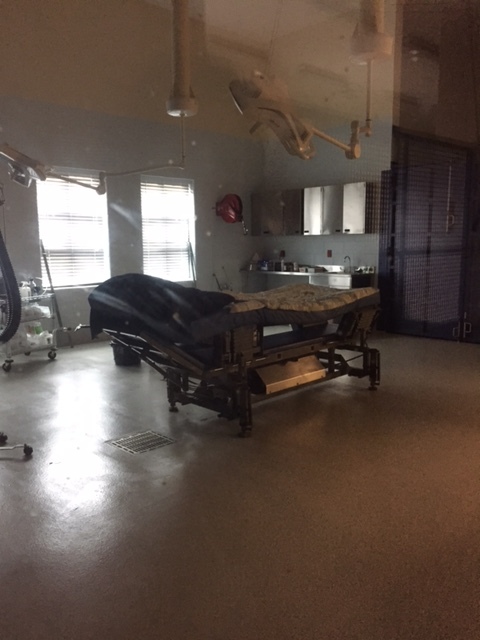 Then on either side of the surgery there are rooms (approx. 15’x15′ – my guess) with padded walls. The horse gets induced in the first and then hoisted up to a mechanism on the track and brought into the surgery and laid down on the table. Then when they are done they go through the surgery to the second padded room where they are woken up. Before they wake up they are lowered down on their side and have ropes attached to their halter and tail that go through pulleys in the ceiling. If the horse goes to get up and starts to fall, assistants can then lower them down more gracefully so they don’t hurt themselves. It was very interesting to see the rooms and I only wish I could have taken more pictures to share! So glad to hear that it went well!! Thanks so much for the update. I know you’re glad that’s behind you. Sending good thoughts for continued healing! So Miles just got his first Osphos injection a month ago. From what I understand (and this may not be 100% accurate and certainly not scientific), it will hopefully help regenerate some of his bone that’s demineralized due to inflammation. My vet recommended that Miles receive the shot once or twice a year, for maintenance purposes. At the time of the injection, my vet said that sometimes the Osphos can cause (or maybe just increase?) the risk for colic within the first 4 hours. So I stayed at the barn and waited with Miles, but he never had any issues. 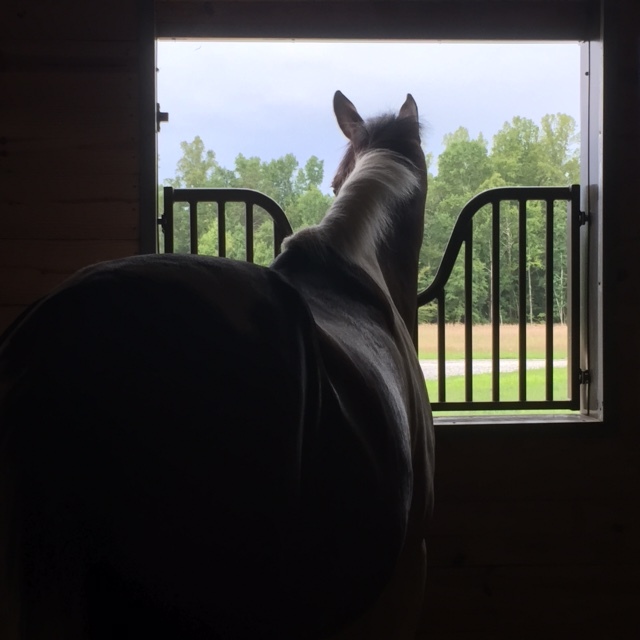 sounds like many reasons for cautious optimism – eventing until he says he can’t, then other career options that are in line with your own plans anyway. fingers crossed his immediate and long term recovery go as smoothly as possible! !